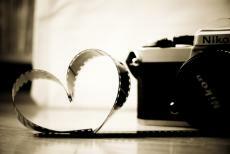 This is a story of a two photographer that fell in love together. This story is my project in english i just wanna share this Hope you will like it!! Chapter 1: The Boring Life of Mine. I am Nate and this is my boring life… I am a photographer I like taking pictures of our nature. I am living alone in my Condo that my parents gave me when I graduated to continue my profession as Photographer. I am 22 Years Old. I am the only child of my parents that’s why I have a boring life but I’m happy because I have lots of friends in my Photography Class. It was a boring night when I was taking pictures of the stars at my terrace until my camera slipped on my hands and accidentally took a picture of a beautiful girl who’s passing by on the streets. She was so beautiful she’s shining like the stars. I quickly developed the photograph and add it on my collections. I was so lucky and I arrived at school earlier than the time. It’s 7:12am and I have 8 minutes more before my class starts. I took a couple of photographs and I saw a colorful butterflies flying around so I followed them until they led me to the garden. I was so happy because I can take pictures of colorful butterflies. I heard shutters of camera and I was surprised because I’ve done taking pictures that time. I followed the noise until I saw a girl holding camera and taking pictures of the colorful butterflies. I was so surprised when I saw the girl she was the one that I took picture of last night. I was happy that time I took her pictures. Because of my happiness I forgot that I have a class. But it’s ok at least I saw the beautiful girl. I developed the pictures and add it on my collections. It was our semestrial break. I am 2 weeks vacant so I’m thinking of spending it on taking pictures on the beautiful places in our place. I went to the park and I saw a pink handkerchief that was dropped by a girl. It was sweet scented and very soft. So I thought of finding the owner of the handkerchief. After a long walk, I smelled a sweet scented fragrant coming from the air. So I followed the scent, until it led me to a very clear and clean river. I heard a soft and beautiful voice singing a love song along the river, I followed it and I saw the beautiful girl again, singing while taking pictures of the forest and the beautiful river. She saw me and quickly hid her camera. I asked her what was her name she answered “Hello, I am Sam, how about you?” “I’m Nate” I answered I’m totally stunned as I talked to her. I felt very awkward that time. Until a sudden rain came, I don’t have a choice so I removed my jacket and cover her with it. We walked to the park, until we reach the park’s waiting shed we’ve waited for a minutes and the rain stopped.“Oh! no I have a meeting now I have to go bye”. I’m so soaked in the rain but I was so happy that I finally met her. Another week passed and I saw her taking pictures of the beautiful sunset. I joined her and she just smiled to me. We put our cameras in the grass as we started talking. I was so happy, the sunset reflects on her beautiful eyes, and her smile makes is so sweet that makes me melt. As we talked happily I asked her “Ah…Um… Sam do you have a boy friend?” and she answered “Uhm…. No I don’t have” with blush on her face. “Ok” I answered happily. “Can I have your cell phone number?”I said.”Ok let me have your phone”. Thanks!! ”Ok I have to leave now my parents is waiting for me bye” with a kiss on my chick, she took then her camera and leave. I shouted like I’m ready to die because of what happen. I went home happily and texted her “Can we go out tomorrow?” She replied “Of Course”. Yes!!! I woke up happily and eat my breakfast and went outside for a walk until I saw her with a boy that forcing her to leave and she looked to me and walked back, they rode into an expensive car. I felt sad or angry I can’t explain what I felt that time because I loved her much that I can’t get angry at her. I kept my camera and quitted on being a Photographer. 2 Years later.. I am living now on my parent’s house and I can’t forget her shining eyes and her sweet smile. I am now working in an office here on a near company in our place. I bought a new camera because I don’t want to use my old camera because it reminds me the pains of my past. I continued my studies and I’m a pro photographer now. I won a lot of medals from Photography Tournament and now I ‘m joining a new “World Wide Tournament”. Only the best photographers in the world can participate on this tournament. I was so nervous that time so I practice taking pictures of the nature. The day before the tournament my camera broke when it accidentally slipped on my hands.“WTF! !” What camera will I use!!! I’m so depressed that time. I don’t have any choice but to use my old camera. I went back on my condo and check my old camera. I checked my old photography and was surprised that all the photos in there is me, as I check all the photos I remembered the time that we put our cameras on the grass maybe she intended to switch our cameras as I got to the last photo there was a message saying “ Nate I’m very sorry.. If you’re reading this message maybe I’m in US now studying to be a pro photographer. I’m very sorry I love you very much from the very first time that I saw you on your terrace that night until the time that I left you. I was trying to say goodbye to you but we haven’t have much time left. Maybe were not really meant to be…Bye Nate….” Suddenly my the tears dropped into my eyes and I started crying “I’m so stupid huhuhuhuhu!!”. I realize all the truth now and I felt guilty for what happened. I should be strong I will win this tournament for her. Today is the tournament. I was so nervous but I have to be strong for her and the tournaments started, until it reach to the Top 2 I was able to reach finals and my opponent was the 4 times champion in “WWT”. Suddenly I smelled sweet scented fragrant and my opponent reveal herself and I was so shocked!! My opponent are the one that I loved very much who’s eyes were shining and her smile was so sweet, and the one who loved me 2 years ago, yes it was Sam and she is smiling at me. Then the finals started and I gave my best and defeated her using her old camera with full of my pictures and photographs from nature just like my old camera that she took 2 years ago and the photography that I took that wins the tournament was a photo of the girl that is taking pictures of the nature and the one that I loved 2 years ago. After the announcement I went to her and I hug her and she said “Do you still love me Nate?” “I always Love You Sam I never had moved on since that day you leaved me I can’t I have any other love because I’m thinking of you all the time forgetting you just makes me love you more!! !” I answered and the crowds started to clap their hands. © Copyright 2019 eLoveStories. All rights reserved. Tsk Tsk Wla k lng taste wahah wag nlng ptulan ang babaw mo pre edi wag k mag basa!!! tsk tsk kya mo ba mkagawa nian? gmawa k mna ng ganyan bago ka mag yabng mo! This page was created in 0.4526 seconds.